The one day that millions of Indian men dread about is Raksha Bandhan. That is one day that girls take advantage of many innocent boys around the globe. Just by tying a piece of twine on our wrists, the girls will adopt many brothers in one single day. To add insult to injury it has become a habit for many girls to expect gifts in kind and cash from their newly adopted brothers. These days girls are demanding RS 500 for every piece of twine they tie on a guy. Usually girls target all the baddies in college to tie rakhis. The mokkai paiyans who don't fall into the dude category always become victims of rakhis. If the guy looks like Virat Kohli or Farhan Akhtar even if he extends his hands the girls won't tie a rakhi on their hands. This is an universal truth. For the rest of the guys, The Guys are requested to remain indoors to avoid such emotional blackmails from so-called-sisters. 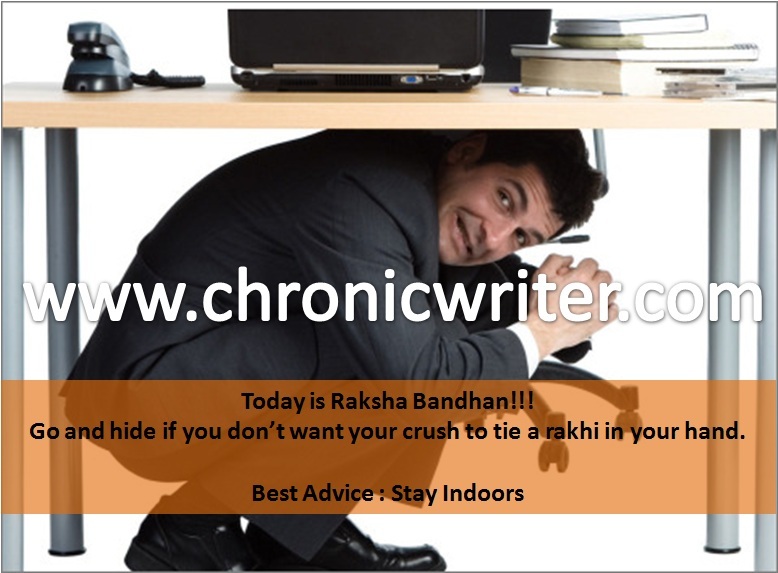 Tips to avoid being tied down by the raatchasa Bandhan. 1) Act as if you had a heart attack and faint immediately. 2) Hug her tight and tell her that you always like hugging and kissing sisters. 3) Cry out for help and plead loudly " Don't do this to me"
5) If you have a gun, shoot her. 6) Hide your hand inside your shirt and tell her that you lost your hands in a road accident the previous night. 7) Tell her that you would accept it only if she knows the history behind raksha bandhan. If nothing works the following can be tried. 1) Lock yourself in your house and switch off your mobile phones. 2) Don't go to school, College, Office. Tell your teacher, lecturer , boss that you have dysentery. If your boss is a male, he might give the same excuse to his boss. Haha Power Star na kokka?